I usually don’t do this looking ahead to the new year thing. I’m pretty cynical about games never really hitting their proposed launch deadlines – and if they do scramble to hit it, it ends up a buggy unplayable mess with little resemblance to the much-hyped and highly anticipated thing in one’s head that one has been working oneself up into a lather for. Something feels a little different about next year though. It doesn’t seem like it’ll be a good year for MMOs, but there are actually games I’m anticipating, among a plentiful crop of releases, which is rare for me. I honestly don’t know how much personal mileage I’m going to get out of this game, but since the Big Alpha, it haunts my dreams. The concept is phenomenal, the graphics are gorgeous, and browsing the Turtle Rock Studios’ forums reveal some really dedicated active devs and that boatloads of work have gone into refining and iterating this game. I have a feeling it’s going to be the rarest title yet – a game that I’m going to be paying full price for, pre-launch, because I want to play it immediately, with the launch crowd, and I want extra cool monsters. Just holding out for the next beta before making my decision. Arkham Asylum and Arkham City are among that rare breed of games that I’ve actually completed, start to finish. Arkham Knight is the last of the trilogy. ‘Nuff said. Games Workshop. Fantasy Necromunda. For the computer, without having to buy and paint miniatures. If I wasn’t so cheap or repulsed by the Early Access concept, I’d already have picked it up. But nah, I’ll wait for it to launch, after more eager fans have rooted out bugs for me. Unless it turns out to be an accidental buggy mess of non-functionality after porting from PS to PC, it’s hard to see how this one can go wrong. The story is a classic, I’ll be happy to play it again without having to root through dusty archived CDs, and updated graphics will make it easier on the eye. Can’t wait to see Manny and Meche and Glottis again. Space exploration and survival on procedurally generated planets. The concept’s not really new (see Mirrormoon EP, for example), but just as intriguing. 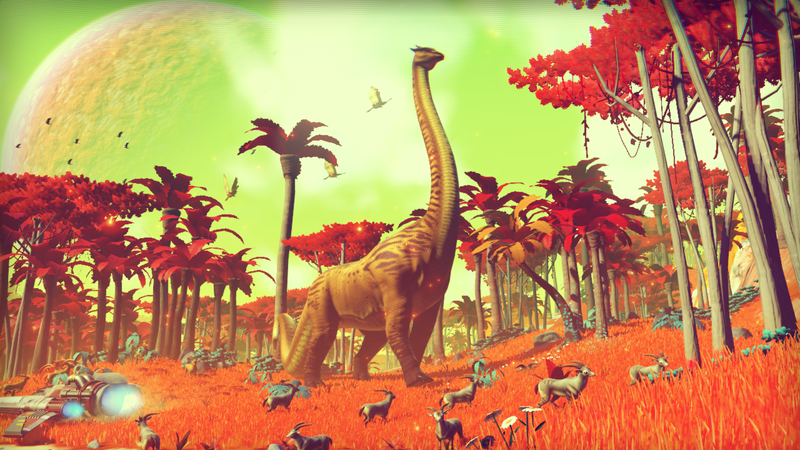 Plus points for No Man’s Sky: it’s a lot prettier than most. The big question on my mind: is there going to be an actual game? Are people going to get lost and directionless after a while, or bored because 9 out of 10 planets are uninteresting rock? Telltale Games takes on Minecraft? Really? Wtf? Can they actually tease out a narrative that people will be interested in, given that Minecraft is more the king of sandbox stories and little personal tales? I mean, all I really want is a resolution to Shadow of Israphel, and I’ll be happy puttering about on my modded Minecraft making up my own narratives. But, y’know, it’s Telltale Games, so I’ll keep a weather eye out all the same. Reports from Early Access are not terribly promising. They speak of bugs, wonky control system and flawed AI. Still, it’s another miniatures turned digital game, and I’ve always wanted to play Warmachine. So KIV and see if they can fix it sufficiently before it actually launches. I really want to like the hopeful successor to Planescape: Torment. I picked up the Numenera tabletop RPG series from Bundle of Holding earlier this year (they’re conveniently holding a reprise sale currently! ), after listening to a Rollplay of it, and was quite impressed with the setting. It’s a sort of Jack Vance or Gene Wolfe-inspired far future earth environment, in which multiple ages of man and possibly alien civilizations have gone by, accreting strange and unknown artifacts known as Numenera in buried ruins. A sci-fi, fantasy, post-apocalyptic setting all-rolled-into-one. The game now… who knows if it’s any good? We can always hope. And see how the reviews turn out. Shadowrun, at least, didn’t turn out so bad. The sister Kickstartered game, also powered by nostalgia – this one claiming inspiration from the Baldur’s Gate and Icewind Dale series of games. Ditto the who knows if it’s any good line. Just watch and wait for now. I really want this to be good. It’s freaking Warhammer 40k, after all. I threw in for the Founder’s Price because I’m just a silly fan. I suspect it will only be passably decent at best, to be honest. And I seriously worry about ping and latency issues making the game unplayable for me. But you know, it’s Warhammer freakin’ 40k, and if all I get is something similar to the City of Heroes character creator where I can dress up Space Marines in neat chapter colors, then I guess I will be a content enough sucker. Here’s hoping that I can at least get a few hours of shooty fun out of it. So that’s the batch of not-quite-all-the-way-mainstream games I plan on keeping an eye on in 2015 to see if they release and if they’re any good. What’s on your list for 2015? 1) Die promptly to darkness due to Steam chatting with a friend. 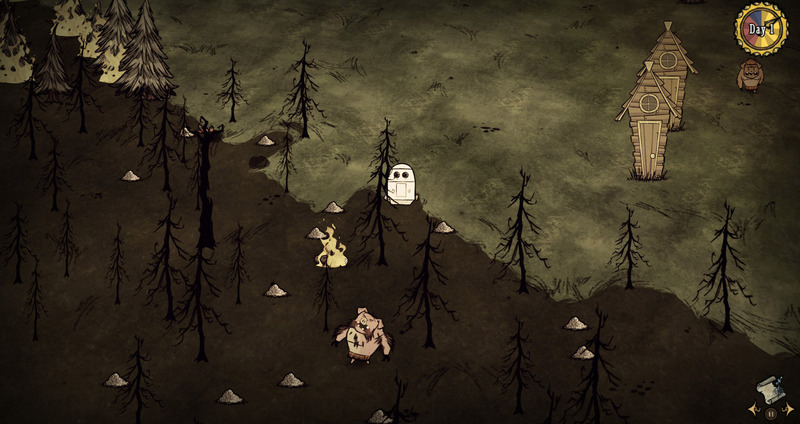 2) Resurrect as a lonely ghost and go exploring. 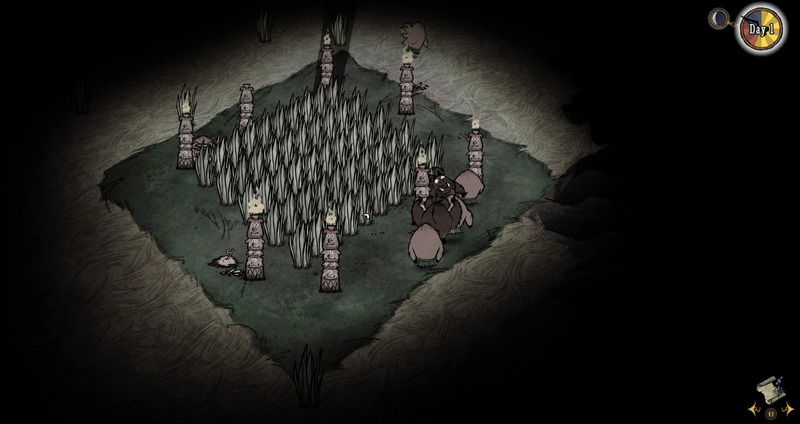 3) Discover you can turn pigs into werepigs. Including guardian pigs. Who will promptly fight each other. 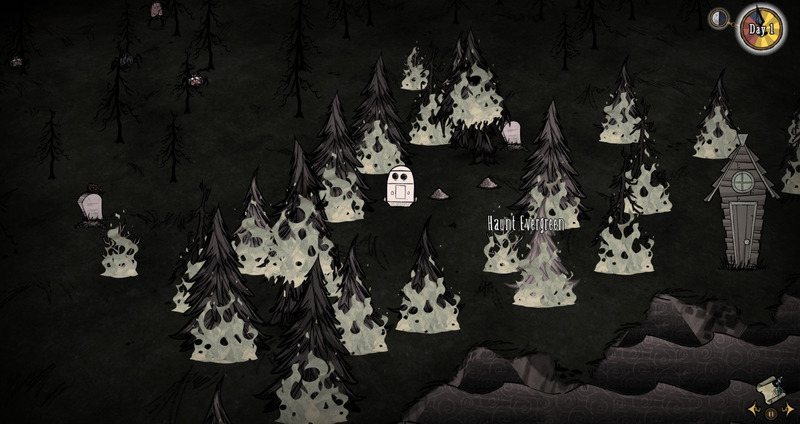 4) Give in to your inner pyromaniac by haunting trees. 5) Admire the fruits of your ghostly labor. Just a perfectly, totally normal tree carcass on the left there. 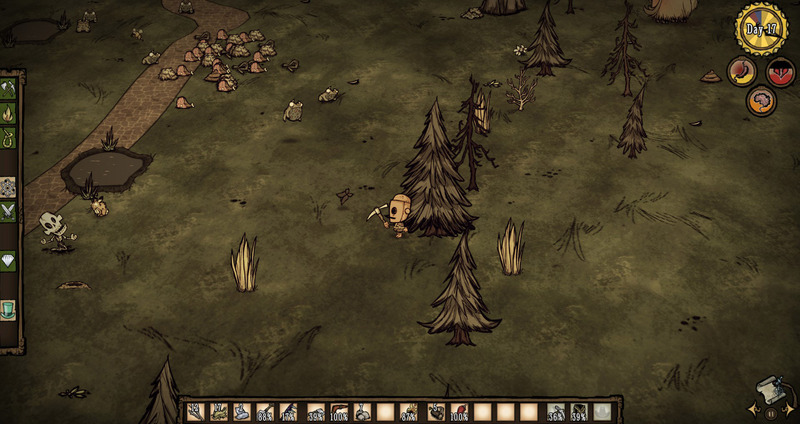 6) View the aftermath of mating beefalo herd + frog ponds as not a bonanza, but just enough to feed all the hungry mouths at home for a few days. 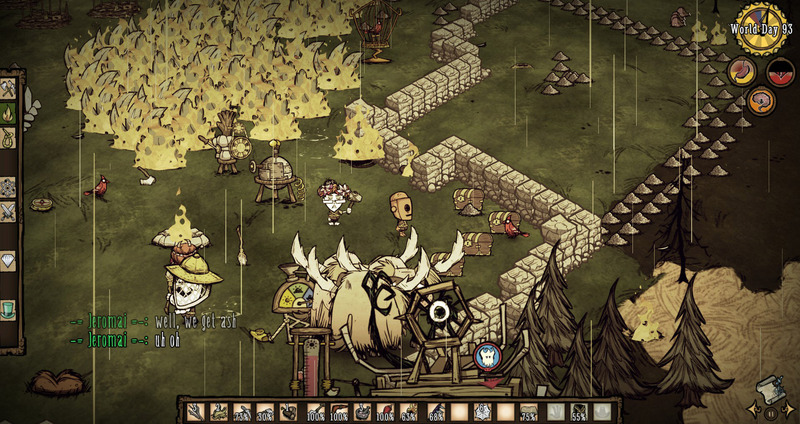 7) Spectate a beefalo shaving attempt gone horribly wrong, knowing you had no hand in it this time! A big thank you to Syl and her friends for hosting the server and graciously welcoming the lil’ robot onto their world. Yeah, I know I’ve gone silent for a while. Between a seasonal cold, RL festivities preparation, lots to do in GW2, a renewal of interest in Minecraft, dabbling with the Don’t Starve Together beta, and Steam sales calling attention back to my massive backlog, -something- had to give. Lists, though. That sounds almost doable to get back into writing shape. I’m pretty late to the response party about the new GW2 dailies, Bhagpuss and Kill Ten Rats having gotten there first, but my main excuse is that I was busy -doing- them, rather than commenting about them. I don’t love ’em, nor do I hate them. They don’t really bother me either way. The one thing I do miss is the unrestricted chance feeling of just having completed a daily by accident, while doing stuff one was doing anyway, but to be honest, most days I was using them in a directed fashion, adjusting my activities to get them knocked out first. New dailies give additional activity-specific rewards – it makes logical sense to get more dragonite ore hunting a world boss, more karma doing events or faster PvP track progression doing PvP. It also makes it still very tempting to complete everything on offer if one has time that day. Bottom line: New system gives more rewards for doing less stuff – I used to only get 5-8 old dailies done for 5-8 AP daily and the old rewards. Now I do 3 at a minimum and get 10 AP. I get the old rewards just for logging in (something I already do daily) and I get new additional rewards for continuing my semi-completionist achievement-hunting ways.